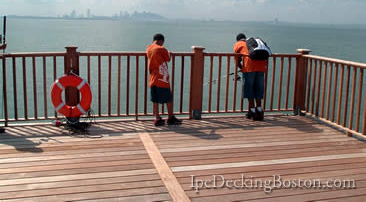 Ipe Decking Boston brings Ipe Decking material to the fine homes of this historic city. Ipe wood is the ideal decking material for the Boston climate and will fit in perfectly with the look of local neighborhoods. Ipe has earned its fame in the Boston area and beyond through its impressive array of unmatched benefits, such as a 75+ year lifespan, a gorgeous color, and a virtually maintenance-free surface. Why should you order from us? Because we have a long track record of superior customer service and commitment to quality. Just ask any of our satisfied customers. In addition to ipe decking, we also sell Cumaru, Tigerwood, and Garapa decking. All of these boast traits similar to ipe, but are available at a lower cost. Because of the large number of shipments we make to the Boston MA area, we are developing a Boston area ipe decking showroom and warehouse. We are still delivering lots of ipe decking and other deck materials weekly to the Boston area; many weeks we make more than one shipment. The frequent shipments from the next closest of our national distribution centers means you save on shipping costs! Please call today and we'll deliver your ipe decking right to your job site. © IpeDeckingBoston.com, All rights reserved.